What makes Caslon fascinating is the fact that it was distributed extensively in British North America, where it was used for the printing the U.S. Declaration of Independence and a majority of political communication employed by the printing presses to spread heated propaganda among the populace. Subsequently, the British attempted to limit the importing of fonts, and thus curtail the education of the masses beyond the comfort level of the ruling class. William Caslon, in the height of fashion. William Caslon provided sets of punches to Colonial American printing presses, and from those originals many printers created their own sets of matrices from which the lead type was cast and used for printing. There are a large number of variations for the Caslon font that appear in the printing specimens of the 1700’s, and the original punches were so widely used and distributed that distressed versions of the Caslon font are still created today, the result of typesetters working as fast and efficiently as possible to spread news and discourse. In researching the version of the font I was using for my cryptographic paintings, Adobe Caslon, I discovered that it was redrawn by one of my classmates at RISD, Carol Twombly. A pleasant, intelligent and friendly individual, I enjoyed conversing with her on subjects of computer science and music, so it is no surprise to me that she went on to become a brilliant typeface designer. One of the qualities of Adobe Caslon that enticed me to use it for my own paintings is that the uppercase letters are balanced and efficient, and I believe this is the result of Carol’s mastery of the historic usage of capital letterforms throughout history, an aspect of her type design that is characteristic of her work. 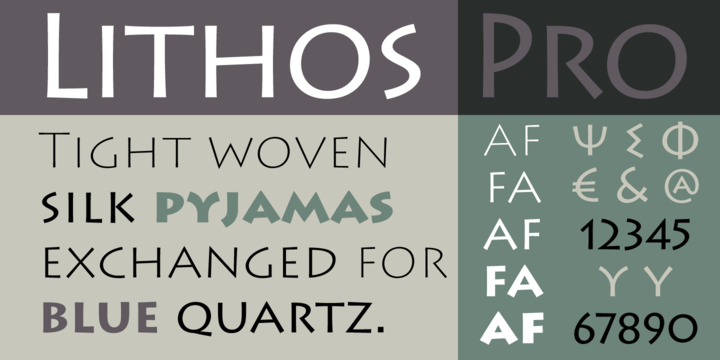 Many of her previous fonts such as Lithos and Trajan were designed for uppercase only. Since my cryptograms are designed in uppercase only, the use of Adobe Caslon capital letters makes perfect sense and serves as a reminder for the variety and beauty of traditional serif typography, something that has become less important as the characters of our alphabet are constantly converted to their numeric equivalents and transmitted in various guises. I suspect that at some point the actual form of a typographic character will become meaningless.